Noelle La Croix is a doctor of veterinary medicine (DVM) and diplomate of the American Conference of Veterinary Ophthalmology (Dip. ACVO). Noelle graduated second in her class in 1997 from the Tufts University School of Veterinary Medicine with academic distinctions, including outstanding performance in ophthalmology. Following graduation, she completed an internship in small animal medicine and surgery at The Animal Medical Center in New York City, and then spent two years as an emergency and critical care veterinarian with Long Island Veterinary Specialists in Plainview, New York. Dr. La Croix completed an ophthalmology residency with Eye Care for Animals in Phoenix, Arizona and was subsequently board-certified in veterinary ophthalmology by the ACVO in 2004. She practiced as an associate ophthalmologist in Dallas, Texas for two years, and in 2007 became the head of the ophthalmology department at the Veterinary Medical Center of Long Island in West Islip, New York (an AAHA-accredited multispecialty practice). Since 2007, she has also acted as the veterinary ophthalmologist for the Guide Dogs Foundation and America’s VetDogs in Smithtown, New York. Dr. La Croix examines the eyes of more than 750 individual dogs, cats, horses, and exotic animals each year. Since 2005, she has also been an active consultant on the internet for the Veterinary Information Network (VIN) answering ophthalmology-related questions posed by veterinarians nationwide. 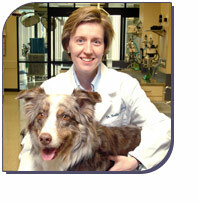 Dr. La Croix has published numerous articles in journals including JAVMA, Veterinary Ophthalmology, Clinical Techniques in Small Animal Practice, Veterinary Dentistry, and Veterinary Medicine. She has also authored chapters in veterinary textbooks concerning ophthalmic anatomy and laser surgery. Dr. La Croix’s special interests in veterinary ophthalmology have focused on uveitis, glaucoma, equine and feline diseases.